앞면 Ian Rank-Broadley's effigy of Elizabeth II as well as the coins 2 dollar denomination and the year. 뒷면 two dragons chasing the pearl of wisdom. 1 oz 2018 Niue Double Dragon Silver Coin We'll make sure you pay the lowest price online, when you purchase the 1 oz 2018 Niue Double Dragon silver coin from our store today. The island of Niue is one of the world's smallest countries, situated 2400 km north-east of New Zealand, Niue is also listed as one of the planet's largest raised coral atolls. The reverse of this striking coin features two dynamic Chinese dragons, ancient symbols of strength and power; they pursue the flaming pearl, which represents immortality, wisdom, prosperity and energy. Set within a reverse-scalloped, decorative frame and upon a field of unique, light refracting design, the reverse feature is joined only by details of the coin's weight and purity. The obverse feature is Ian Rank-Broadley's detailed rendering of Elizabeth II in profile, also set on a field of beautiful, 'dragon-scale' design, within the same reverse-scalloped frame. Also on the obverse, Elizabeth II's name, the coin's year of issue and denominational value. The New Zealand Mint has created another sure-fire winner, with a coin that's not only minted to the highest standards but also uniquely artful in design. 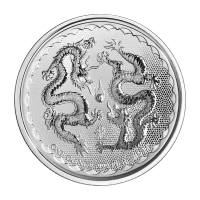 Own this spectacular symbol of wealth, longevity and good fortune and expand your portfolio with a 1 oz Niue Double Dragon silver coin today.